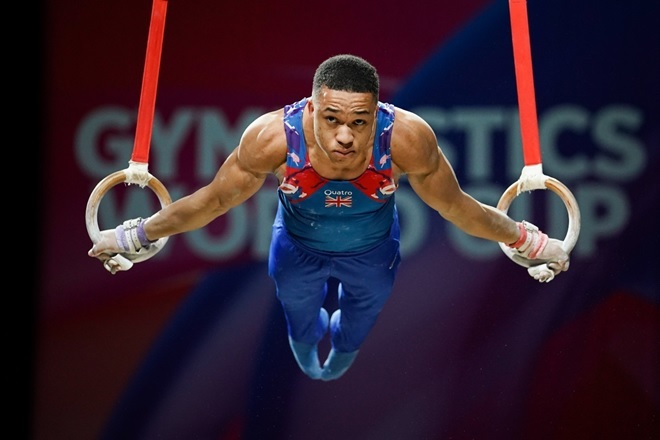 Joe Fraser, from City of Birmingham Gym Club, competed in front of a home crowd on Saturday for the World Cup, narrowly missing out on a medal finishing in 4th place with a score of 78.231. Joe started his competition on pommel and showed no signs of nerves in front of the home crowd, executing his routine well for a score of 13.933. Moving on to rings, Joe packed the difficulty in to his routine which included two crucifix holds and a well-executed dismount with just the slightest step back on landing, scoring 13.100. On vault, Joe scored well with 14.199, before moving on to parallel bars, one of his favoured apparatus. Holding each of the strength elements well and taking a small step on dismount, he scored 14.300. The loudest cheer of the day came for Joe’s high bar routine. Producing three huge release and catch elements and a double-double straight landing that was stuck, he scored 13.900. Finishing on floor, Joe scored 13.866 thanks to multiple stuck landings. Click here to read more about the World Cup.